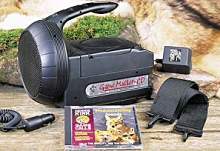 The ultimate in predator game calls, the Dennis Kirk GameMaster-CD uses a Hi-fidelity long range CD player with a built-in 20-watt speaker for clarity and volume that is unsurpassed. This lightweight, compact unit has a 12-volt rechargeable battery and comes with a heavy-duty wall and auto charger. The detachable nylon shoulder strapallows for hands free carrying. This unit is a must for all serious predator hunters. FREE CD INCLUDED: General Predator Vol. 1. **OPTIONAL: This unit can be controlled by wireless remote up to 400 yards (NOT INCLUDED). The newly redesigned Dennis Kirk GameMaster-XLT combines calling power and clarity in a rugged, lightweight, affordable unit. It includes a rechargeable 20-watt speaker and a detachable nylon sholder strap for easy carring in the field. This unit uses standard cassette tapes and features an all-new electronic Master Control Panel, which provides qucik, easy access to numerous functions. This unit is a must for all serious predator hunters. FREE CASSETTE TAPE INCLUDED: Cottontail Distress. **OPTIONAL: This unit can be controlled by wireless remote up to 400 yards (NOT INCLUDED). Game Buster Pro. This all new Game Buster Pro is one of the most compact and rugged designed game calls on the market. The 15-watt detachable speaker produces superior sound quality with extra loud volume and the molded in handle and belt loops allows for easy transportation. The heavy-duty 6-volt rechargeable battery provides up many hours of continuous play between charges. Unit also includes a 25 foot speaker cord and heavy-duty charger. Optional accessories include a headlight, spotlight or scope light. 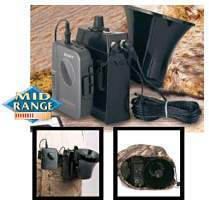 This economically priced electronic game call is packed with some of the same features found in most higher priced game calls. Its compact design makes it one of the smallest calls on the market. Do not let its small size and low price fool you. This rugged game call is built to last. 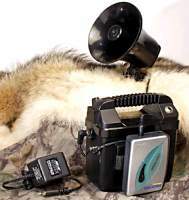 Whether you are just getting started using electronic game calls and like its low price, or you are an experienced caller who prefers a lightweight and compact size, the "Game Buster" is the electronic caller you have been looking for. * Water resistant camouflage carry-all bag.